Learn how to manage your woodland for wildlife. Use the Woodland Wildlife Toolkit to create an action plan for your woodland. There will also be an opportunity to have a tour of the Sylva Wood Centre and hear more about the Making Local Woods Work project. Bring: Laptop (if possible) for practical session. Boots/waterproofs for woodland walk. Today sees the launch of a new online toolkit that provides advice on managing woodlands for wildlife, in particular rare and declining species that are dependent on woodland habitats. The Woodland Wildlife Toolkit is aimed at anyone who owns or manages a woodland, or advises others about woodland management. Assess your wood’s condition to get an overview of the condition of your wood’s habitats and identify any issues you may need to address. Woodland guidance for practical advice on management techniques, information on woodland management issues and legal considerations. A series of species factsheets provides summary information for all the species in the toolkit. Data behind the toolkit has been sourced from a wide number of sources which are detailed on the website. Examples include data from the Bat Conservation Trust, British Trust for Ornithology, Butterfly Conservation, Botanical Society of Britain and Ireland, British Lichen Society, British Mycological Society, Fungus Conservation Trust, People’s Trust for Endangered Species, and the National Biodiversity Network. 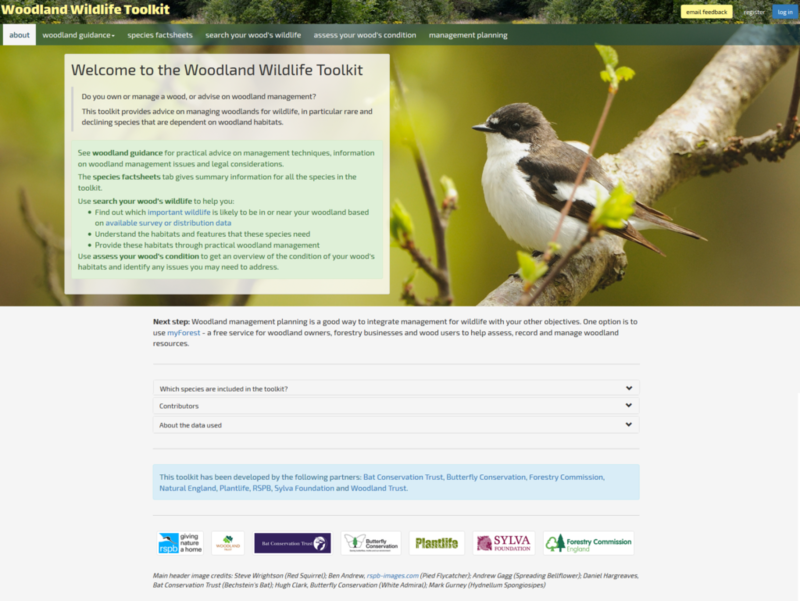 We were delighted to be asked to develop the Woodland Wildlife Toolkit by the partnership behind the project. At the heart of good woodland stewardship is a woodland management plan, backed by information about the wildlife it contains. This is why we have also enabled a shared login between the toolkit and our myForest platform which supports management planning. Much of our wildlife that relies on woodland is in decline. This new, innovative toolkit offers locally focussed guidance to woodland owners and managers to help them cater for the needs of this wildlife. We hope it will become the go-to tool for woodland wildlife advice. The toolkit is being launched today at a special event hosted by the National Forest, during which presentations were delivered by senior staff from many of its supporters. The Woodland Wildlife Toolkit has been supported and developed by: Bat Conservation Trust, Butterfly Conservation, Forestry Commission, Natural England, Plantlife, RSPB, Sylva Foundation and Woodland Trust.